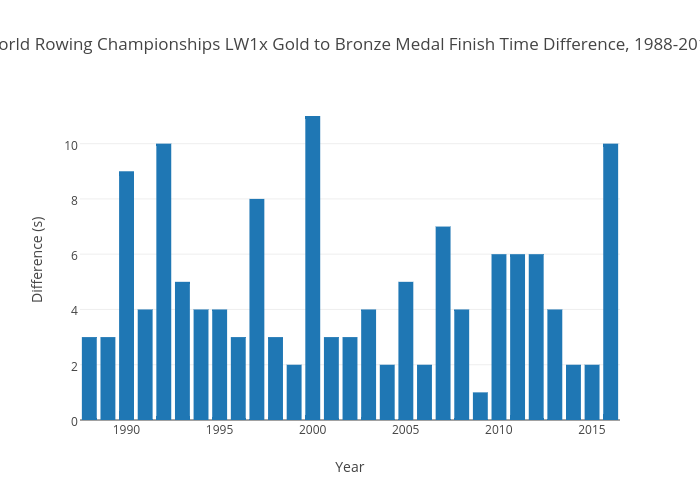 Danidewitt's interactive graph and data of "World Rowing Championships LW1x Gold to Bronze Medal Finish Time Difference, 1988-2016" is a filled bar chart, showing Difference; with Year in the x-axis and Difference (s) in the y-axis.. The x-axis shows values from 1987.5 to 2016.5. The y-axis shows values from 0 to 11.578947368421053.